The core idea of this project is land saving, water saving, energy saving, material saving and indoor environment protection. It focuses on Smart Micro-Grid Solar Power technology based on office buildings, lighting energy-saving technology, building adjustment, R&D and demonstration of building mixed ventilation technology. Through the actual data to lead the green building trend in South China and the world, which can play a demonstration role for the ultra-low energy design of green buildings in the hot summer and warm winter areas. 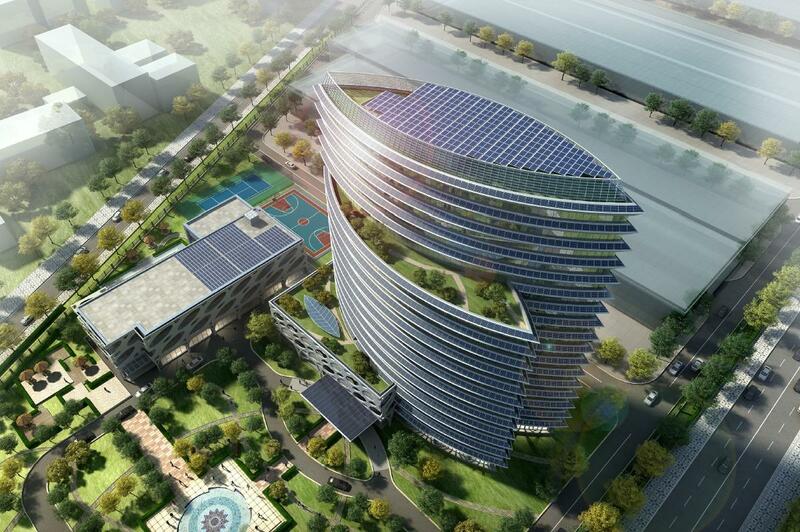 Under the unremitting efforts of Singyes Solar R&D team, the design energy consumption is 50kWh/(m2·year), which is about 1/3 of the average energy consumption of office buildings in Guangdong Province. According to the actual operation of 2017, the actual energy consumption has reduced to 42.9kWh/(m2·year) then, the energy consumption of HVAC and lighting is about 13.3kWh/(m2·year), which greatly saves the energy consumption of building operation. This application is used to alleviate the current global energy exhaustion crisis in the environment. The angle provides energy security for renewable recycling and healthy sustainable development in remote areas and islands, and promotes the application and promotion of renewable energy. The integration of environmentally friendly and energy-saving solar thermal buildings can provide clean and economical access to energy and contribute to the healthy and sustainable development of the world. In terms of economic benefits, through research and development and practical applications, it can be radiated to many other high-tech industries. These technologies are closely related to high-tech industries and pillar industries such as electronic information, advanced manufacturing, new materials, energy and environmental protection, and modern service industries, thereby promoting the sustained and rapid progress of related technologies in these industries, and are also significant for the development of these industries.